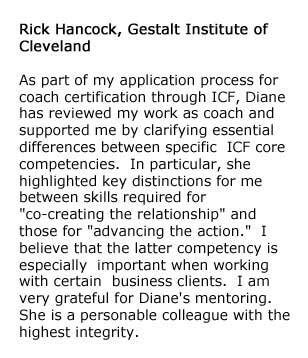 As part of my application process for coach certification through ICF, Diane has reviewed my work as coach and supported me by clarifying essential differences between specific ICF core competencies. In particular, she highlighted key distinctions for me between skills required for “co-creating the relationship” and those for “advancing the action.” I believe that the latter competency is especially important when working with certain business clients. I am very grateful for Diane’s mentoring. She is a personable colleague with the highest integrity.